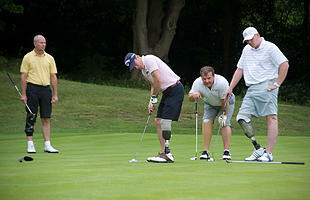 Bids are invited in excess of £1,500 to secure your team of 3 + second choice of celebrity golfer - to play at The National Golf Club Challenge Celebrity Golf Day, celebrating 10 years of fundraising for our wounded service personnel. You and two friends will play with a celebrity to complete your fourball – the event is being hosted by the exceptional Centurion Club in Hertfordshire on Monday 13th September. Teams of 3 strictly limited to 20... This event will be oversubscribed... Book your place NOW! The majestic Centurion Club course explores existing pine woodland to give the course a distinctly mature and natural feel. The course has been carefully yet dramatically shaped to offer both an aesthetically beautiful contribution, and a genuine challenge. Tees raised well above fairway level provide broad and spectacular views across the landscape; there are some 80 bunkers and four major water features on the course - all of which can be avoided by careful planning. Prepared to tournament specifications, the course offers some of the best putting surfaces to be found anywhere in the country. Built on sand, the bent grass surfaces are like carpets – fast, true and firm, yet receptive to the right kind of shot. Visit the The Centurion Club.